The French use trains to travel between cities. Given that there is no inter-city bus service (only international buses) the train system is highly developed, well-frequented, and less expensive than flying. Fares tend to be higher during the morning and evening rush hours. Discounts are available to travelers under the age of 25. 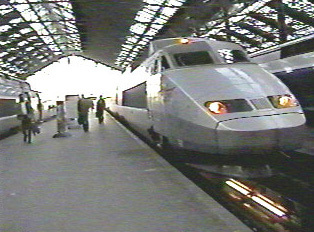 The most desirable kind of train is known as the Train à Grand Vitesse, or TGV. These trains are new and clean, have bar cars, first class, and accommodations for comfortable sleeping. The other trains are older and slower but still acceptable. Train stations offer the usual amenities of newspaper stands, snack bars, bars, cafes, and restrooms. Taxi stands are located outside, and one can usually find the local bus station somewhere nearby. Numerous new airlines have emerged that offer the traveler more competitive prices on tickets. There are two airports in Paris and several smaller airports in other parts of the country. French airports resemble all other large international airports in the amenities of restaurants, shops and money exchange bureaus. Airports are easily accessible by subway, train, bus, shuttle, or taxi, and there are always hotels nearby that one can reach by shuttle. "Validating a Train Ticket Before Stepping on the Train"